These four students are also currently enrolled in a Television Broadcasting Technology class at their respective high schools. 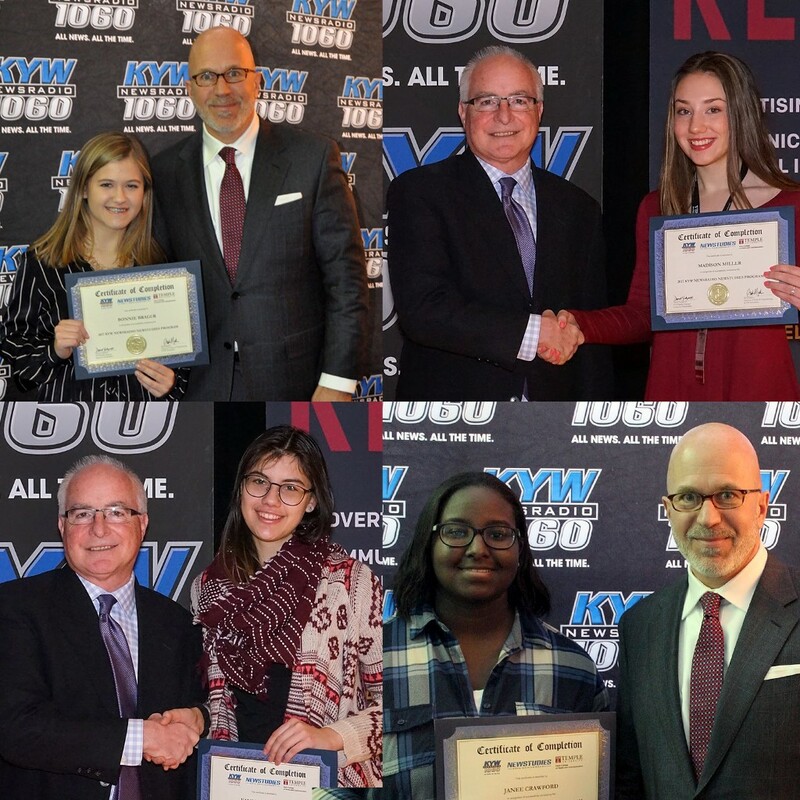 Pictured clockwise starting at top left are: Lenape High School junior Bonnie Brager with radio host Michael Smerconish, Seneca High School sophomore Madison Miller with KYW Newsradio Director of News & Programming Steve Butler, Cherokee High School junior Vanessa Bennett with KYW Newsradio Director of News & Programming Steve Butler and Cherokee High School junior Janee Crawford with radio host Michael Smerconish. Four students from the Lenape Regional High School District recently graduated from the KYW Newsradio’s 2017 Newstudies Program sponsored by Temple University’s Klein College of Media and Communication. Lenape High School junior Bonnie Brager, Seneca High School sophomore Madison Miller and Cherokee High School juniors Vanessa Bennett and Janee Crawford were four of the more than 100 students from across the Delaware Valley who attended workshops in the fall at the KYW Studios in Philadelphia. According to the district, since 1968, KYW Newsradio has given high school students the opportunity to learn about the inner workings of a major market radio station with the Newstudies Student Reporter Program. Students come to the KYW Newsradio studios to learn about news writing, reporting, ethics and interviewing skills from station managers, editors, reporters, anchors and guest speakers. According to the district, the students then research, write and record news stories about their school and community. Radio host and 1980 KYW Newstudies graduate Michael Smerconish was the keynote speaker at the graduation ceremony held back in December at Temple University’s Performing Arts Center. To listen to the students’ finished news stories, visit the KYW Newsradio website at http://philadelphia.cbslocal.com/newstudies/.